Meaning, Culture and Survival A new book by Harvey Markowitz, associate professor of anthropology, examines Native Americans and Catholic missionaries. Q: The cover of “Converting the Rosebud” is an eye-catching photograph of residents of the Saint Francis Mission, taken in 1931: Six Lakota adults and one child, clad in traditional dress of fringed buckskin and feathered headdresses, and seven Catholic nuns wearing their own traditional garb of habits, coifs and wimples. Which came first, the photo or the dissertation? A: It’s a fantastic image. When I started seriously contemplating about transforming my dissertation into a book — 25, 30 years ago — I immediately thought of this photograph for its cover. I guess you could say that this was putting the cart way before the horse. The photo was taken by one of the mission’s priests — Father Eugene Buechel — and is housed at the Marquette University archives in Milwaukee. Q: Did you choose the topic, or did it choose you? A: A little of both. When I finished my qualifying exams in anthropology at Indiana University, my advisor at the time, Raymond DeMallie, asked me if I would be open to doing my fieldwork with, and dissertation on, a Lakota community, just as he had. The Saint Francis Mission on the Rosebud Lakota Reservation, he told me, was interested in finding a student who could translate some diaries that had been kept by the German Jesuit missionaries who had been stationed at the mission in the late 19th century. The mission was offering six months of room, board and a tiny stipend as payment for this service. I immediately volunteered, thinking that I could do my own fieldwork — which, as I remember, was on contemporary Lakota ethics — when not translating the diaries. As it turned out, however, the more work I did on the diaries, the more I got interested in how these Jesuits from Germany ended up at a mission in Lakota country U.S.A. The root of this unusual staffing, I soon discovered, could be traced in part to German chancellor Otto von Bismarck’s anti-Catholic policy known as the Kulturkampf,which resulted in the emigration of hundreds of Catholic religious. As it turned out, just at the time that many of these Jesuits were fleeing their homeland for the United States, Catholic Indian missions and boarding schools needing clergy and teachers were cropping up on reservations in the United States, including Dakota Territory. One of these, established in 1886, was the Saint Francis Mission among the Sicangu Lakotas of the Rosebud Reservation; the other, Holy Rosary Mission, among the Oglala Lakotas, opened a year later, on the Pine Ridge Reservation. I ultimately decided that constructing my dissertation around the diaries was a more interesting and potentially useful project than the one I had planned to do before arriving at the mission. Q: What did you find in these diaries? A: The most fascinating findings concerned the thoughts and interactions of these missionaries with the Lakotas they encountered, as agents of both religious and social conversion. The Lakotas hadn’t been on Rosebud for that long and were still living in their traditional communities and as closely as they could to customary lifeways. The primary goal of the Catholic priests was to save the Lakotas’ souls by converting them to Catholicism. However, they were also working hand-in-hand with the federal government to wipe out the Lakotas’ culture so that they could be integrated into the country’s social mainstream. The missionaries also wrote about much of the anti-Catholicism, nativism, they encountered while working with the Protestant-dominated U.S. Indian Office. These battles waged on high at a national level eventually filtered down to the local level and often influenced what materials the missionaries at Saint Francis could use in their school. It also eventually made the issue of government-supported sectarian schools on Indian reservations a hot-button topic. Even though they were supposed to be working together, the conflicts that sometimes erupted between Rosebud’s government agents and the Catholic missionaries were so raw that it’s hard to believe that they actually viewed themselves as partners. By contrast, there was never even a sham of cooperation between Rosebud’s Catholic and Protestant missionaries, who were always at each other’s throats. The scandal of this fierce competition was not often lost on the Lakotas. Q: Why were the Catholics so invested in assimilating the Lakotas? Even with all its problems, this close relationship between the federal government and Catholic and Protestant churches in Indian affairs sometimes strikes modern readers as breaching the separation of church and state. This partnership reached its height under President Ulysses S. Grant and his so-called Peace Policy, in which the U.S. Indian Office divided up the 73 Indian reservations among the mainline Christian denominations. Each church was given exclusive rights over the secular and religious affairs of the reservations to which it was assigned. Though Grant and his advisers had designed the policy as a way to regenerate the scandal-riddled Indian Office, the Peace Policy was soon plagued by interdenominational squabbles of its own, which eventually led to its self-destruction. Despite this failure, assimilation policy itself survived into the first decades of the 20th century. Q: You tell two intertwined stories, of the Catholic missionaries and the Lakotas. How did those stories unfold as you did the research? A: For many years, the story of federal Indian relations was told as if American Indians were merely passive recipients of the policies being flung out from Washington, D.C. They were therefore reduced to satellites orbiting around what was considered the really important story of government administration. It is now recognized that this perspective radically shortchanged and devalued what was actually going on in Indian communities. Following this line of thought, it struck me that a comprehensive presentation of the early history of Saint Francis Mission would not only describe the relationship between the U.S. government and the St. Francis religious, but also attempt to understand Lakota perspectives on mission and the missionizing process: how they understood the tenets and practices of Catholicism; how they filtered what the missionaries said and taught through the traditional categories of Lakota thought; how they attempted to use the spiritual and material resources of the Catholic Church to their own advantage; and most importantly, how they looked for and worked fissures in the dominating federal and religious structures to try to achieve their own ends. Q: You had these incredible primary sources, the Jesuits’ diaries, that told you what the missionaries were thinking and doing. How did you learn about the Lakotas’ thoughts and actions? A: One of the best sources for Native understandings of Catholicism was, ironically, a Jesuit source. Father Florentine Digmann kept a journal, a history of the mission for the nearly 40 years he was its superior. Of course, Father Digmann recorded events from the perspective of a Jesuit of his times. And because of this, much of what he writes — especially his observations about Lakota religion and culture — could simply be dismissed as outdated and ethnocentric. In fact, however, by using an anthropological concept of culture, one can get at the often-unstated assumptions about the nature and goals of mission as well as what Lakotas valued about their own world and the various ways they responded to the changes that were being demanded of them. Other sources included missionary journals of all kinds, both in English and in German. Many of these were fundraising organs and, as such, had to be read in view of the audience to whom they were appealing: how did they portray Lakotas, missionaries, the mission’s schoolchildren, to win donations. Q: How did the Lakota perspective emerge from the puzzle? A: This was one of the most enjoyable parts of writing the book. American Indians, including Lakotas, were and are very reverential toward sacred power, that found in their own and other religions. They were therefore dumbfounded when they encountered representatives of Christian traditions, all of whom demanded that they must give up their own sacred practices in order to join their churches. Lakotas strategized about how to deal with this new kind of message. Some followed missionaries’ demands and abandoned their traditional ceremonies; others refused to have anything to do with these new “prayers.” The majority, however, commenced consciously and unconsciously blending the two religions in ways that approximated as closely as possible conventional Lakota ways of thinking, believing and acting. One of the more amusing aspects of the process of Lakota missionization was how some of the missionaries’ own practices actually encouraged the survival of beliefs and ceremonies they sought to eradicate. For example, in their preaching, priests regularly used the Lakota terms by which Sicangus referred to their sacred beings and processes. By so doing, their sermons actually served as a bridge through which the Lakotas’ sacred worldview was given new life. Q: It seems that this incorporation enabled the Lakotas to retain control over their spiritual beliefs and practices. How were they able to do that? Lakotas interpreted the holy water and blessed oils used in the Catholic sacraments as sacred in and of themselves, instead of being vehicles containing God’s holy spirit. Given this, it is not surprising that they should equate them and other Catholic paraphernalia with the wonder-working items that were used in their own ceremonies. The primary goal of Lakota rituals was to achieve health and a good life here on earth, not to secure a place in an otherworldly paradise. It thus made perfect sense to them to call a priest to pray over and administer “sacred” water and oils to a person suffering very common ailments. Q: You write in detail of the relationship between these two groups of people, European Catholic missionaries and Native Americans. What other stories did you find? A: Those “other stories” fill most of the 300 pages of the book. For Lakotas, they generally relate to the explicit and implicit modes of resistance they mounted to upend or slow down the changes that the missionaries and government agents were forcing upon them. They loved their traditional ways because they filled their lives with meaning and purpose, something that “white” customs could not do. It is amazing that in this clash of cultures, Sicangus and other Lakotas were able to rescue so much of their pre-reservation culture. In a way, the book relates a very contemporary message that there are ways of living and relating to others that are worth struggling to understand. 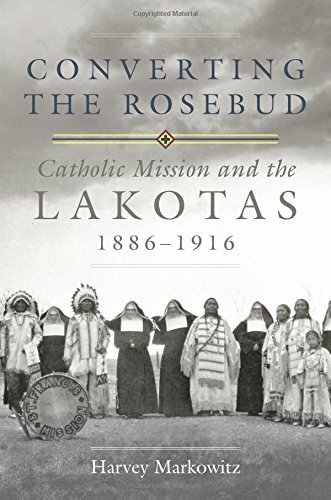 “Converting the Rosebud: Catholic Mission and the Lakotas, 1886-1916” (University of Oklahoma Press, 2018) is the new book by Harvey Markowitz, associate professor of anthropology at Washington and Lee University. He shaped it from his doctoral dissertation, which he wrote for his 2002 Ph.D. in American church history from the University of Chicago. Markowitz examines the Saint Francis Indian Mission on the Sicangu Lakota Rosebud Reservation, in South Dakota, from 1886 and its founding to 1916 and its destruction by fire. The complex story blends Lakota culture, Catholic mission work, and federal Indian policy. The missionaries were Jesuit priests from Germany and Franciscan nuns from the Netherlands. The Sicangu Lakotas were wards of the federal government and had a recent new name: the Rosebud Sioux. Markowitz earned an M.A. in anthropology from Indiana University Bloomington in 1975. After beginning his doctoral studies at the University of Chicago in 1985, he made a couple of fruitful detours. First came nine years as associate and acting director at the D’Arcy McNickle Center for American Indian and Indigenous Studies at the Newberry Library, in Chicago. Then he logged three years at the Smithsonian Institution’s National Museum of the American Indian, from 1999 to 2002. He arrived at W&L in 2003. His other books are “American Indian Biographies” (as a co-editor) and “Seeing Red— Hollywood’s Pixeled Skin: American and Film” (Michigan State University Press, 2013) (co-edited with LeAnne Howe).